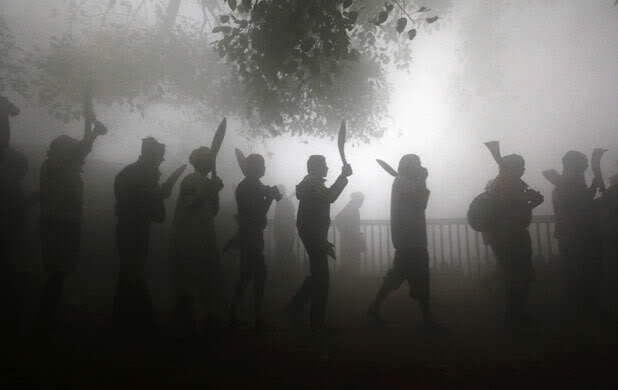 A procession of men carrying kukris and other blades to be used in the ritual slaughter of hundreds of animals to the Goddess Gadhimai. Source: IKRHS (hat tip to Spiral), 2009. Victor Turner, the cultural anthropologist, famously argued that all symbols are “multivocal,” meaning a single symbol can take on a multiplicity of meanings. Humans have a way of looking at complexes of symbols, perhaps embedded in a ritual or a myth, and finding exactly the right mix of meaning necessary to produce emotional power. No matter how many times we hear the same stories we can still get something new out of them, because as the listener we are a vital part of the symbolic process. And we are always changing. That is the genius of a symbolic system. By leaving some things unsaid it gains the ability to generate an almost infinite set of meanings. I am interested in the sorts of symbols and myth that attach themselves to weapons. Not so much the legends of great individuals who wielded these blades (though they can certainly be interesting as well) but rather stories that focus on the weapon itself. It is interesting to note that some weapons, and certain cultures, are more likely to generate these sorts of myths than others. For all of the romance about the bowie knife on the American frontier, I have never really heard many myths attached to the blades themselves. Alternatively, a single royal kris in Java might embody enough symbolism and folklore to keep an anthropology graduate student employed for a year. Where these symbolic or mythic systems are present they should be carefully studied. Even simple stories about the history or nature of weapons can reveal much about the culture and social systems that created them. Few of Asia’s bladed weapons enjoy quite so rich a folklore as the kukris of Nepal. While western collectors are finally beginning to gain some sophistication in terms of identifying and dating the various pieces, we still do not have a great appreciation of these weapons as ethnographic artifacts. For a variety of reasons, I suspect that the age of cheap and abundant access to kukris in the west is coming to a close. As Nepal continues to develop economically it will become less willing to allow antique weapons to cross its borders. And the number of individuals collecting and studying kukris right now seems to be higher than it has ever been. That means that there is an increased demand for the material that is now in circulation. Rather than simply amassing ever larger collections, the next step for many aficionados will be to embark on a dedicated process of study of the pieces that they do have. For military blades this will mean learning more about the conflicts they served in, and when possible, the specific units they served with. For civilian or “villager” pieces this means learning more about the history, beliefs and way of life of the people who produced and carried these knives. This is where I see the growth in kukri collecting over the next ten years or so. And it’s a good thing. Nothing increases the intrinsic value of a collection quite like actually knowing what you have. I would like to illustrate this point by looking at just two of the many symbolic traditions both revolving around the image of the kukri. The first of these is a Gorkha/Hindu/nationalist legend explaining the ultimate origins of the Kukri. This legend places the origins of the kukri, like the ruling dynasty, outside of Nepal. In fact, this connection to the “pure” Shiva based Hinduism of India is central to implied claim of legitimacy of the former royal family. Yet in this tradition the kukri itself is left an “open symbol” whose meaning and use can change as the understanding of the state evolves. The second set of symbols is derived from Kirate Shamanism. Rather than seeing the Kukri as a representation of social or political reality, they instead view them as a microcosmic representation of a larger cosmic reality. There is real richness here, and it is reflected in a variety of folk traditions regarding the protective powers of kukris. In this symbolic system the kukri is viewed as being an indigenous invention, and its meaning finds full expression in certain elements of Nepalese society. Please note that the purpose of this exercise is not to judge either of these stories in terms of their historical accuracy. And there are many other myths and legends about kukri that I have not touched on simply because I do not have the space. Rather, I want to think about how the stories that we tell about our weapons reveals who we are as a society. Nor will there ever be just one story. Different groups will reflect their political agendas and cultural concerns in the narratives that they pass on. Prime Minister Bhim Shumsher, circa 1930. 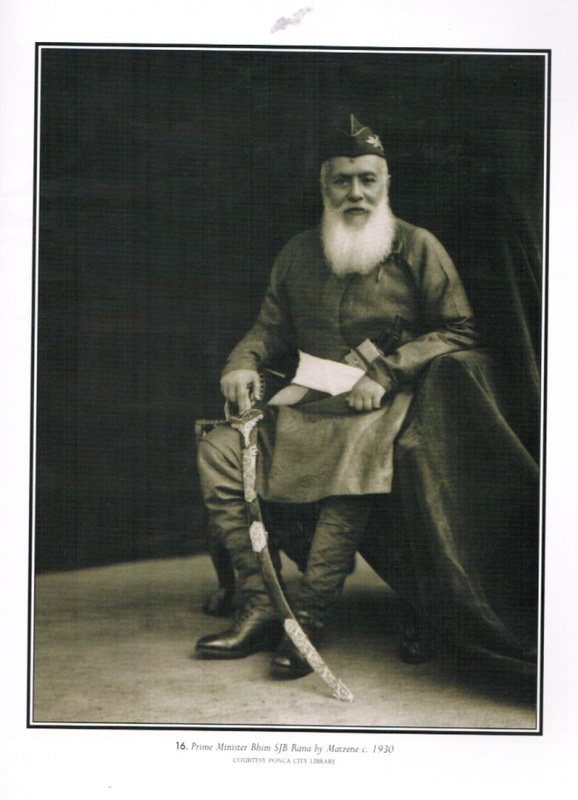 Note the kukri prominently displayed in his belt. In Nepal the kukri was an important symbol of political leadership. Bappa Rawal (713-810) established the Mewar dynasty in what is now Rajasthan India. In Nepal he is also viewed as the ultimate progenitor of the Gorkha Kingdom (which would eventually unify Nepal in the early 18th century) and as such he is a valued national ancestor. According to legend the future monarch spent much of his childhood in the mountains near Nagda, tending the cattle of the Brahmins and charming the locals in his high spirited hijinks. After engaging in a game of his own creation that involved “marrying” a number of local village girls, he and his friends were forced to flee into hiding in the mountains by their enraged parents. While traveling and hunting in the mountains the group came across the renown warrior-saint Guru Gorakhnath. The saint was by himself at the mouth of a cave, deep in meditation. Knowing that the area could be dangerous, and wishing to protect that holy man from any threat that might disturb his meditation Bappa Rawal stayed behind to stand guard. Upon emerging from his meditation Guru Gorakhnath was pleased with the young prince’s devotion. So much so that he gave him his knife, a kukri. Further, the renown master of the mystical arts pronounced spells on this blade ensuring that it could cut anything, even rock. The warrior saint then entrusted Bappa Rawal with a special charge. He was to go to Afghanistan (then a Hindu/Buddhist region) and fight the Muslim invaders who were forcibly converting the population to Islam. He did, and for a time was successful in turning the tide against the new religion which was increasingly encroaching on India itself. The basic outlines of this story are fairly widespread. A quick literature search reveals that the story of Gorakhnath’s sword or knife has been circulating in English since the 19th century and obviously the tradition has a longer heritage in South Asia. Still, it is very interesting to me the degree to which this story underlays the acceptance of the kukri as a symbol of the newly unified state of Nepal, under Gurkha ethnic and political control. Not only that, but it provides a constitution for an expansionist foreign policy. It is not uncommon to come across rifles and bayonets (including some in kukri form) manufactured in Nepal in the mid 19th century that still have special inscriptions invoking Guru Gorakhnath. Further, the notch at the base of the blade of any kukri is often said to represent (among other things) Shiva’s trident. Of course Shiva was the patron deity of Gorkhnath. Kukris themselves became a critical part of the royal regalia of 19th and 20th century Nepal, and were featured in official portraits and on postage stamps. 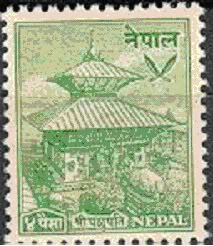 A Nepalese postage stamp from the mid 1960s. Note the crossed kukris as a national symbol. 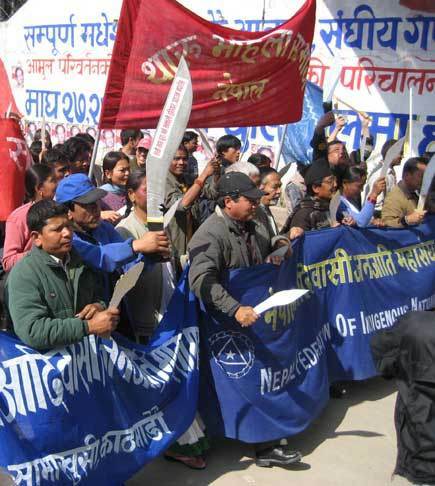 The association between the kukri and the state of Nepal is still a strong one today. It is not uncommon for the kukri, both as a symbol and as a weapon, to be appropriated by various protest movements. In this context it is a fascinating symbol because it is “empty.” Depending on the context, anything associated with the polity, or a grievance against it, can be rolled into it. It is a political symbol par excellence. This then is the fundamental paradox of the political mythology of the kukri. On the one hand the weapon gains it’s legitimacy because of its origins in classical India and its association with a Saint who worships Shiva, and yet it becomes the accepted universal symbol of Nepal with its more diverse population and less orthodox religious scene. Large symbolic kukris being used in a demonstration calling for the adoption of proportional representation in voting in local elections, 2007. Source: Ujir Magar. More demonstrators carrying symbolic kukris. 2007. The previous myth focused on the kukris relationship to the ruling house of Nepal and the polity itself. Our next set of symbols are drawn not so much from a single myth, but rather from a set of rituals that make up Kirati religion, an interesting and understudied form of shamanism indigenous to a number of tribes in Western Nepal. In fact, the kukri (often paired with a “female” sickle) is a central instrument that is often prominently displayed on the altars of shamans throughout the region. My main source of information (and the rather lengthy quote below) is the book Shamanism and Tantra in the Himalayas by Claudia Muller-Ebeling, Christian Ratsch and Surendra Bahadur Shahi. This volume, published in 2002 by the Inner Traditions Press in Rochester Vermont attempts to tackle the practice of Nepalese Shamanism from both a practitioners and student’s standpoint. It is one of the few sources I can find for contemporary minority religious practice in Nepal today. It is written more like ethnography than a formal history. This book is the result of invasive participant/observer research rather than broad literature or historical reviews. The construction of both ritual and household altars is an important part of Kirati Shamanistic practices. There are a number of goals any Shaman may attempt to accomplish (from locating a spirit to bringing about healing to dealing with a malevolent ghost) and the objects placed on the altar are both spiritual tools and a symbolic representation of the cosmos that the Shaman attempts to mediate and navigate. Kirati Shaman treats a patient in front of a huge altar collection. Source: Tengri news, 2012. Of special interest to us most altars in this region of the country include both a sickle, which represents the moon and female energy, and a kukri, which represents the sun, and male energy. Kukris are also used in other religious traditions throughout the area, and obviously the sun/moon imagery shows up frequently throughout Nepal. What makes a Kirati altar unique is its use of bamboo, cotton string and flowers to represent the seven chakras, the four directions and the three worlds. Obviously navigating the three worlds is key to a Shaman’s calling. Like many other groups in Nepal the Kirati (which includes the Sunwar, the Rai and the Limbu among many other groups) believe that the Kukri has a special role in dispelling demons and evil spirits. They specifically link that aspect of kukri’s metaphysical being to the process by which its edge is differentially hardened with water by the smith. It is the hissing and spattering of the hot iron that gives it demon deflecting powers. When addressing the kukri in this local shamanistic context the authors state that the Kirati themselves claim to have “invented” the Kukri. They do not associate it with Guru Gorakhnath or the “nation state.” The kukri in these rituals exists in an unending “cosmic time” (to use Eliade’s category). It doesn’t have a beginning any more than the Kirati people do. “The art of forging it [the kukri] has been especially cultivated by the Rai. As a result the best examples come from the eastern territories of Nepal. The finest quality knives are produced in Chainpur, the picturesque, medieval and graceful mountain region near Tumlingtar. Like the phurba [ritual dagger], the khukuri dagger keeps demons away. The karda, the small knife that is part of the kukri equipment, is also placed on the altar for defense. In rare cases the karda has a genuine shamanistic appearance: the wooden handle is carved, for example, with depictions of nandi, the steer of Shiva, and of the three faces of Bhairab. The blade may also have three holes representing the three worlds and the three times. The Shaman can activate any kukri set with his phurba mantra and use it for shamanizing. Then the kukri itself becomes and phurba. The “eye” of the blade, the small round notch that allows the blood to flow out in animal sacrifices, is considered by the Kirati to be the third eye of Shiva. The knife is the lingam of Shiva; the sheath is naturally the yoni of the great goddess. Everything that can be fit inside something else is a shrine of lingam-yoni or yab-yum, and of the cosmic sexual union. The dagger itself represents the three worlds: the blade is the heavens, the handle is the earth, the end is the underworld. The blade is considered to be Shiva as well, while the handle is Shakti and the end is Bindu. The khukuri is therefore the ideal sacrificial knife. With it, man cuts the life of the sacrificial animal and connects it with the cosmos, and with myself. Our life is likewise on a razors edge. A modern kirati tribesman carrying a large working kukri in his belt. Source: Wikimedia. Once again, the point of this post is not to judge the veracity of these stories. I am sure that some very good kukris have been made in Chainpur region, but judging whether or not they really are the “best” is totally besides the point of the exercise. Our goal here is not so much to learn about the kukris themselves, but rather by looking at the variety of stories that are told about them, to better appreciate the groups that produce and use them. This returns us to Victor Turner’s essential insight about the multivocality of symbols. 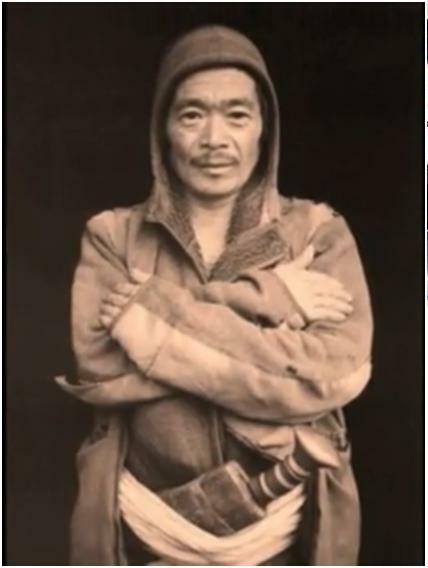 While the Kirati informant may have described a fairly specific type of knife as being ideal for ritual work, the pictures of actual practitioners included by the authors show them using a wide variety of fairly ordinary “villager” type knives in their operations. The more militant kukris produced by the group who produced the myth of Guru Gorakhnath are not really all that different from the knives of the Shamans setting out their ritual altars. In both cases the material item, and by extension the basic symbol, is the same. Yet this simple symbol has been put to a striking variety of uses. The overriding similarity is that in both cases the knife is used to represent some sort of overarching social order. It represents a force which is invisible, yet compels obedience from members of society. The image of the kukri is deeply implicated with leadership and kingship. In one case the kukri has come to represent a dynastic family, and the modern polyglot state that they constructed. The kukri is the ability of the state to expand, thrive and protect its essential social order. It has become a universal, and oddly modern, symbol of national unity (and occasionally civil conflict), even though its roots are said to lay in India. In the second case what is “ruled” is the society of the village, lineage and tribe. Here the kukri represents the power to enter into the “myth of the eternal return.” It is part of the power to access forces of causality that stand outside of a modern “rational” world view. The kukri is symbolic of the ability to restore an essential element of lost harmony to the community. Yet while the Shaman negotiates with the cosmos, the realm of his power in this world is limited to the particular and local. Again the essential paradox arises. At some times and places the kukri is a universal and national symbol. In other contexts and in other hands it is limited and esoteric. And that right there tells us something pretty interesting about the complex and layered nature of identity in Nepalese society. On a broader level I hope that this post has demonstrated the importance of considering not only the legends of heroes, but also the myths of the weapons that they wield. The basic pattern that we just observed with the kukri is not really unique to Nepal. From India to Japan, from Mongolia to Bali we find stories that clearly associate weapons with different aspects of kingship and social identity. Nor are the interpretations of these myths always straightforward. Different groups in society might interpret the same symbol in a variety of ways. By coming to terms with these traditions we discover another way in which martial studies can contribute to our understanding of basic social structures and beliefs. 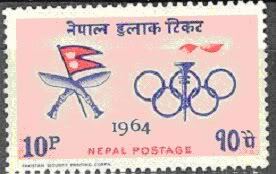 Another Nepalese stamp featuring crossed kukri. This postage stamp was issued in 1949. As first photo says it is not cow but buffalo. hindus do not kill cows.